Really, miners? You'd rather cry for one hundred twenty-four editions (and counting) of the Highsec Miner Grab Bag--instead of simply obeying the Code? Helli Trevelyan brought disturbing news of two unnamed individuals being murdered IRL by unnamed Agents of the New Order. Luckily, unnamed ex-employees of CCP are on the case. I'll update everyone if I hear more about this situation. And if necessary, I'll request further information by sending a petition to an ex-GM. The freighter gankers have gotten quite good at destroying jump freighters before they activate their covops cloaks. The Anti-Gankers, on the other hand, fail regardless of the game's actual mechanics. ...But judging by Ulv's decision to give up mining, it seems Agent Bing is doing precisely what the Code requires. In the post-gank afterglow, an unusually candid miner admitted that he doesn't care--not about the Code, and certainly not about the game. These are the "players" whose interests EVE should be designed to serve? I think not! Remember, parents: When you break the law of highsec, you're setting an example for your children to follow. If you want your children to obey your rules and the laws of society, obey the Code! The merc army is still mobilizing, I understand. Agent Snigie Audanie got mixed signals from the Russian miner he ganked. On the one hand, the miner seemed to admit to botting. On the other hand, he suggested Snigie should watch his bank account. Ten million isk incoming? Maybe the miner will be paying by cash. Our Agents have become so effective that they can shut down illegal mining operations without even entering the system! 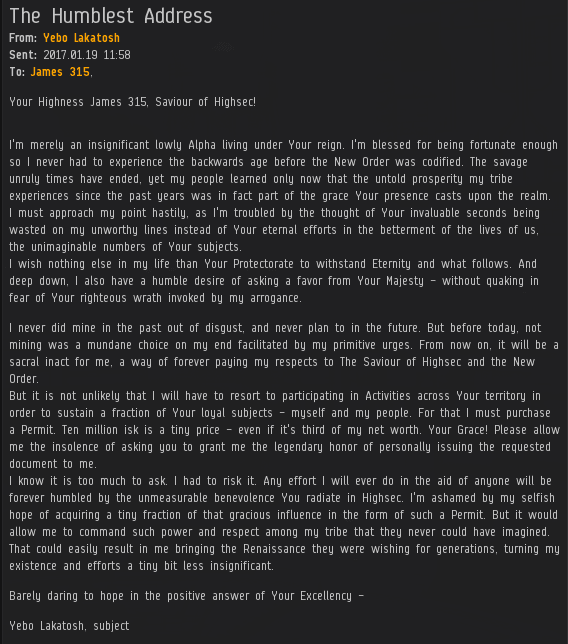 Slowly but surely, highsec miners are learning to show proper respect to their rulers. Things are changing for the better. "You set a bad example for children." Starts spewing vulgar language, I think this guy has Hypocrisy V trained. Yebo Lakatosh is a model citizen. Good for him! His career will be long and fruitful. Thank you. Such display of faith towards my humble self from a high-esteemed Knight makes the stars shine brigher on me. I also bumped a miner a few days after, but he failed to live up to the gravity of gesture because of being AFK. It feels the subjects of the Protectorate doesn't appreciate all the hard work you do for them. It's beyond respectable that the lack of their gratitude does not erode your dedication. And hear me James 315! I see through you! I admire you yet im disgusted by you and your influence over the powerful yet gullible agents of your cause. Your greed will be your downfall. I pray to Bob for the deliverance of your soul! I will never bow down to TNT or they alts. That danish guy running TNT don't seem to get any smarter lol! I am not scared and I never cry over people that have no life other then the game! LOL! TNT alts need to go back to school and finish there education lol! I am not afraid of any of you IRL, I know you cant fist fight because you are too fat from playing fail eve all day, and I am fit with 11% body fat! You should come visit me IRL, if your mom will let you! You better stay in your basement LOL!!! Thats why eve is dieing! Gankers use excuses to justify killing nonpvp characters in easy to kill ships. LoL so sad! Its real cute that TNT can kill anything but mining/industy ships LOL! All these comments are from the same IP, try harder TNT/CODE alts! Again I never cry over loosers in video games! LOL! Anyone that wants to join our 100 man resistance just contact me in game. Who the hell is TNT? TNT is in the Imperium Coalition and are therefore "Goons." This is the first time I have seen a conspiracy theory about them though. And of course, "I never cry over loosers in video games!" as the conclusion of his gigantic tear post. I wonder if some day we'll see this guy logged in. Ah, nullsec stuff, got it. As a miner (no, I do not have my indulgences updated), I find it sad when people shed virtual tears like this (i.e. Codex). It just goes to prove that people have no real life. I don't care too much for the NHO or CODEdot, but I have respect. This is because they are actually stirring things up and bringing a change to the status quo. I have always tanked my Skiff and used Stabs instead of mining upgrades, but that is mostly because I mine outside of their jurisdiction (i.e. w-space). Yet I do not change any of my fit for when I fly in High Sec. This is because I typically fly in the lower sec status systems where the bumping and ganking occur. I don't pay the indulgence because I do not act in any way against the living document that is the Code. I am always at my keyboard with game up. Only time I look away from the screen is if i'm doing work for my Networking courses, and even then, that is pen and paper, so the screen never changes. I only try to take in the amounts of ore that I need for reprocessing, and I have charts in my room for how long I need to have strip miners on rock to get the amount of ore to reprocess and get the materials I need. I have never spammed in local except normal conversations, and do my best to abstain from using profanity. I only put my combat drones out when pirates warp in, and only long enough to deal with the situation. Wow these antiganker carebears sound a lot like the liberals in the USA now. - whiney, upset and full of failure. It's only a matter of time before they they put up a slogan and chant to the camera proclaiming peace'n'lurve. Then to be arrested by the NYPD for assault. Codex drawing real life comparisons to eve again it seems. Too funny. Reckon lawrence has him to a tee.